Egg allergies are one of the most common food allergies in children. An allergy to eggs may develop as young as infancy. Research studies have found that about 70% of people (who have an allergy to eggs) will outgrow their allergy by the age of 16. It’s uncommon but possible to develop an egg allergy later in life. Sometimes a child may outgrow an egg allergy and it may reappear later as an adult. What causes allergies to foods such as eggs? When a person has an allergy to eggs their immune system mistakenly sees the proteins in the egg as harmful, causing an allergic reaction. While an allergy to egg whites is the most common, both egg yolks and egg whites contain proteins that may cause an allergic reaction. If you have an allergy to only the egg yolk or egg white, it is still important to avoid eating eggs all together because it is impossible to completely separate the egg yolk from the egg white. Anaphylaxis usually happens within seconds to minutes of exposure to an allergen (in this case-eggs) and can be life-threatening without emergency medical treatment. How can I tell if I am allergic to eggs? Your health care provider will review your symptoms and either refer you to an allergy specialist called an “allergist” or do a test to see what you might be allergic to. There are a few different tests that can determine if a person has an allergy to eggs. Symptoms of food allergies can be mild to severe. A skin prick test is done by pricking the skin and exposing small amounts of egg protein. If someone has an allergy to the protein a small bump/hive will appear at the test site. A blood test can also be done to check for egg allergies. Blood and skin tests are often done along with a food challenge. A food challenge involves adding small amounts of egg into your diet to see if you have a reaction. If nothing happens, more egg will be given as signs of food allergy are monitored. Only do a food challenge if told to do so by a medical professional. Some vaccines (such as the flu vaccine) contain egg protein. However, depending on how severe your allergy symptoms are, you may be able to get the flu vaccine administered by injection. If you are between the ages of 18-49, your health care provider may approve one type of injected flu vaccine that does not contain egg protein. The CDC does not endorse a nasal spray version of the flu vaccine for anyone with an egg allergy If you have an egg allergy and are interested in getting a flu vaccine, talk to your primary care provider (PCP) or allergist to find out if it is safe for you. If I have an egg allergy, can I eat cake and cookies and other baked goods? 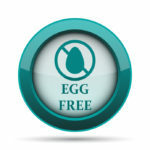 Some people with an egg allergy may be able to tolerate cooked eggs (such as those used in baked goods, scrambled, etc. ), but there is no diagnostic test to determine who can tolerate cooked eggs and who cannot. Talk to your allergist or health care provider before eating products containing cooked egg. How do I know if a food has egg in it? What about baking? Are there any egg substitutes? *Be sure to buy egg replacement and NOT egg substitutes. Egg substitutes contain egg and are unsafe for people with egg allergies. Egg replacements may be more widely available at stores that sell a variety of vegan products. What is the treatment for egg allergies? There is currently no cure for egg allergies. The best way to prevent a reaction is to avoid eggs and foods containing egg products. Depending on how severe the allergic reaction is, medication such as an antihistamine may help to improve the symptoms of a mild egg allergy. However, an antihistamine will not prevent a reaction to eggs or treat a more severe allergy. In the case of a severe allergy, it may be recommended by your allergist or primary care provider to always carry an epinephrine autoinjector.